From USA Today bestselling author Julianne MacLean comes an inspiring novel about sisters, forgiveness, and second chances. It’s one of the most popular titles in the Color of Heaven Series, where people are affected by real life magic and miracles that change everything they once believed about life and love. Diana Moore is a successful career woman, confident that her handsome live-in boyfriend is about to propose. But her entire world is turned upside down when she learns of a mysterious woman who lives and works nearby – a woman who is her exact mirror image. Then she meets Dr. Jacob Peterson, a brilliant cardiac surgeon with an uncanny ability to heal those who are broken. With his help, Diana embarks upon a journey to restore her belief in the human spirit, and recover a sense of hope – that happiness, and love, may still be in reach for those willing to believe in second chances. Bonus content: includes a bookclub discussion guide. "A gripping, emotional tale you'll want to read in one sitting." 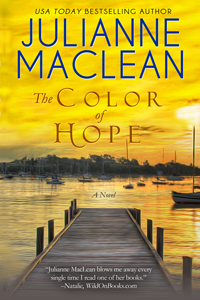 “I never know what to say about a Julianne MacLean book, except to say YOU HAVE TO READ IT." "…an emotionally charged, riveting exploration of how our lives may change within the scope of a single event. And sometimes what we want isn’t always what we need. Fabulous, thought-provoking read." "A box of tissues should be included in the purchase price of this book.... I finished THE COLOR OF HEAVEN in a matter of hours, but I've no doubt the read and the lessons imparted through Sophie's story will stay with me... probably forever. THE COLOR OF HEAVEN is an incredibly poignant and unbelievably gripping novel, deserving Romance Junkies' highest rating." "I was so pulled into this story I thought at times I WAS the character. Julianne MacLean certainly grabbed me with this book. I absolutely loved it! ...It all felt so real. It's like Alice falling through the rabbit hole, I got to live out someone else's life if only through my own imagination." "Wow! This is one of those "l couldn't put it down" books. The penny dropped right at the end of this amazing story…. Believe me when I say that this is a page turner like you have never read before." "It makes the reader think about what could have been, and loves past, and makes you wonder if you are leading the life you're meant to be leading. Thought-provoking, emotionally-intense and riveting, Ms. MacLean delivers another 5-star romance…"